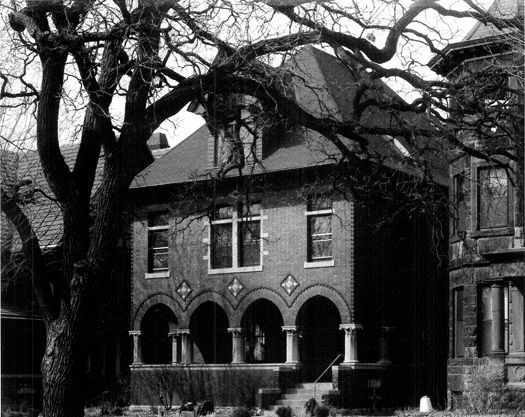 The Livingston House was a project Gilbert worked on during a trip to Europe in the fall of 1897. The design is inspired by Venetian Renaissance sources. In Venice, the vaporetto would have pulled up to steps rising from the canal to the loggia. 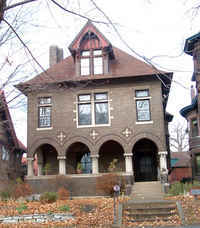 Here the loggia is a porch that overlooks Summit Avenue~St. Paul's Grand Canal. Gilbert was in New York ready to sail for Europe when he worked out the design for the front dormer. [CG to Office, November 11,1897, Box: 19, Fldr. : General Correspondence, January 1896-June 1899, MNHS-CGP.] 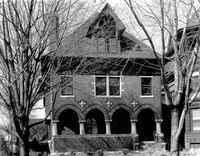 The detailing of the porch columns came to him while he was on the SS Friesland in the English Channel. He wrote his office that the porch capitals should be strong like those in the chancery arch of St. Clement's Church (1894). [CG to Office, November 26,1897, Box: 4, Fldr. 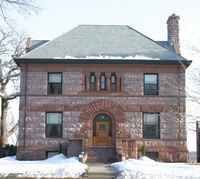 : 26, MNHS-CGP.] The interior of the Livingston House is one of the finest residential interiors ever designed by Gilbert. He specified all of the materials and colors. He determined the reception room should be delicate lilac and mauve with a gold-leaf ceiling. Some of the interior is still original.